"Ustadh" Abdur-Rahman Hasan is a follower of the manhaj of Abu al-Hasan al-Ma'ribee and Ali al-Hasan al-Halabi, from the generality of the Mumayyi'ah. He burst onto the scene around 2012 and found ways to soak up the followers of Abu al-Hasan al-Ma'ribee, Ali Hasan al-Halabi and likewise the extremist Yahya al-Hajuri (strange combination). 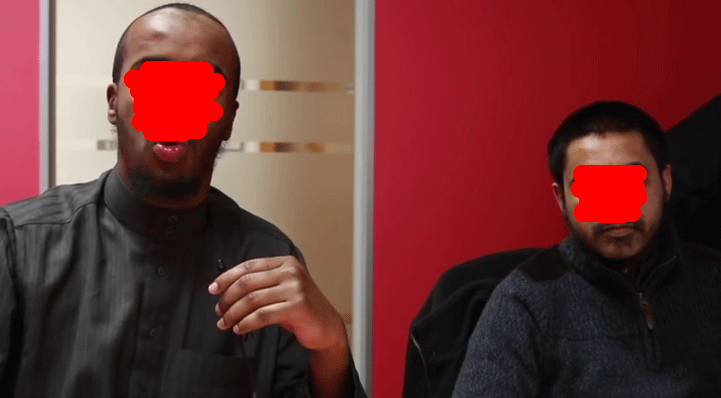 In December 2014, this muta'aalim (pseudo-scholar) - [who gives his own fataawaa and even has his own fatwa channel on the tube] - participated in a debate with Takfiri Kharijite deviant who makes takfir of Salafi scholars and the rulers and considers Makkah and Madinah as lands of kufr and is a student of the Tahriris such as Anjem Chaudhury and Omar Bakri. In doing this, Abdur-Rahman Hasan opposed the Salafi manhaj and within the debate itself there are many calamities. He grovels and praises the Takfiri devil, signals that he has come as a student, will take his pen out to take notes, says that the Takfiri devil "afaada wa ajaada" (has provided good benefit) and at times, even referred to him as "shaykh" and even says to him "May Allaah elevate your status." That is right, may Allaha elevate the status of one who holds the contemporary Salafi scholars to be apostates! He was not able to subdue the Takfiri in debate and the end result was that the Takfiris ran with this, published the video debate on the tube and it has acquired 60,000 or so hits and led to many people falling prey to the doubts of these Takfiri Kharijites and holding a positive opinion about ISIS. We will take up the story from here before we present the judgement of the Salafi scholars upon this muta'aalim (pretentious pseudo-scholar). First: This individual was spoken against by some of the Salafi callers such as Abdulilah Lahmami and Abu Khadeejah and others shortly after this debate. This is not to say that he was not already disparaged and upon misguidance, because this man was already known to be upon the manhaj of Abu al-Hasan al-Ma'ribee and Ali Hasan al-Halabi, and their false principles. 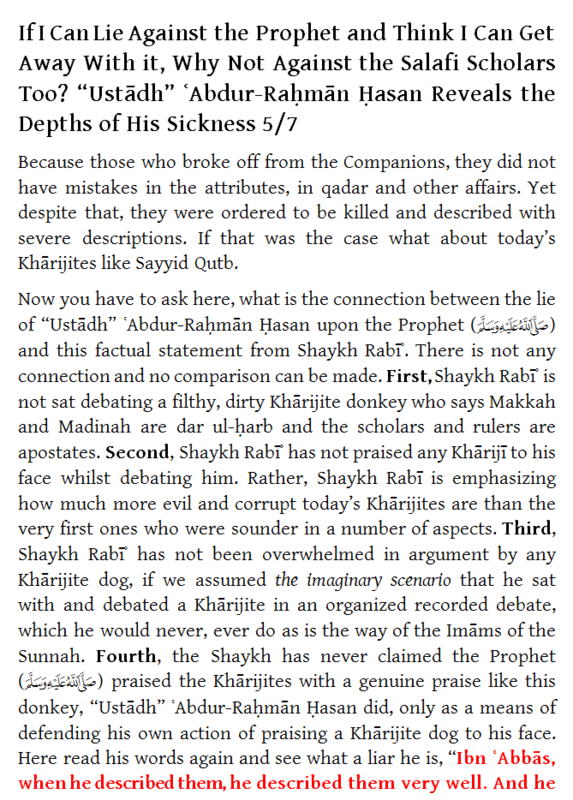 Second: It was clear that he feeling the heat from two sides: From the Takfiri devils who had humiliated him (his followers started doing damage-control videos afterwards) and also from the Salafis who exposed his deviation in doing what he did and for being played and gamed by the Takfiri Kharijites [causing harm as a result of following his ego thereby, thinking he will be able to overcome the Takfiri Kharijite]. 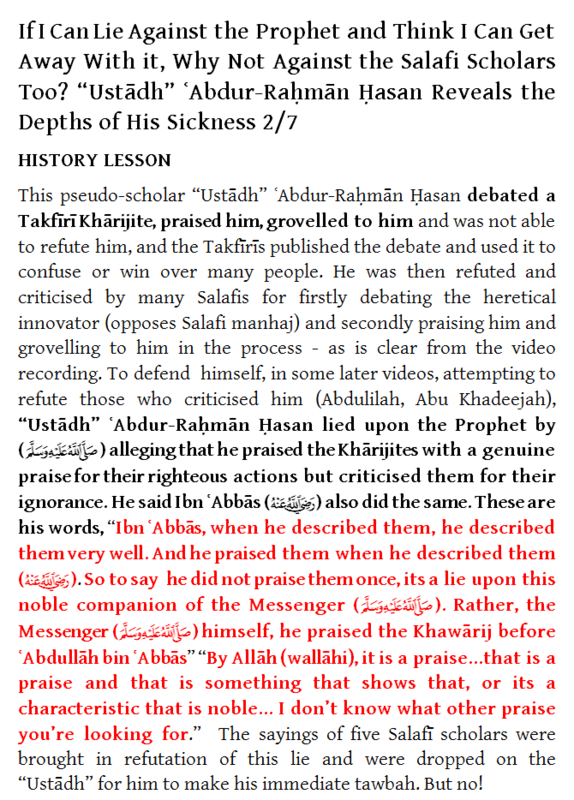 Third: To defend himself and justify his behaviour (the debate and grovelling to and praising the Takfiri Kharijite he was debating) he uttered the lie that Ibn Abbaas (radiyallaahu anhu) praised the Kharijites, and that even the Prophet (sallallaahu alayhi wasallam) praised the Kharijites when he made mention of their actions of worship such as prayer, fasting and recitation of the Quran. 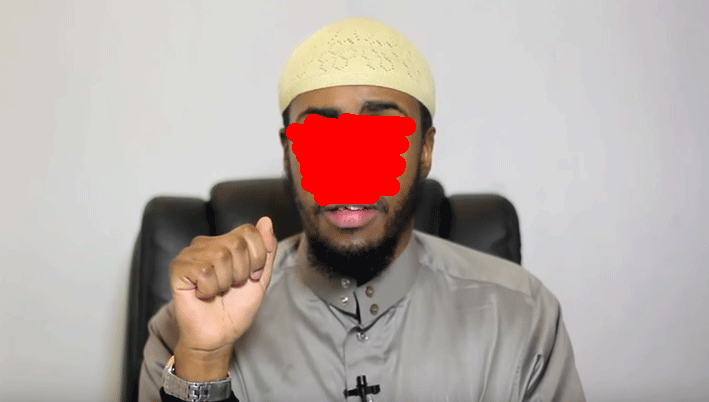 He did this in a series of videos two weeks ago (10th November 2015) in which he was again, playing the muta'aalim and offering his so-called advice to Abdulilah and Abu Khadeejah. Ibn ʿAbbās (radiyallaahu anhu), when he described them, he described them very well. And he praised them when he described them. So to say he did not praise them once, its a lie upon this noble companion of the Messenger (sallallaahu alayhi wasallam). Rather, the Messenger (sallallaahu alayhi wasallam) himself, he praised the Khawārij before ʿAbdullāh bin ʿAbbās... By Allāh (wallāhi), it is a praise...that is a praise and that is something that shows that, or its a characteristic that is noble... I don't know what other praise you're looking for. The meaning of the word praise is clear in the English language, it means to laud, approve, admire and commend. This lie of Abdur-Rahman Hasan upon both the Prophet (sallallaahu alayhi wasallam) and Ibn Abbaas (radiyallaahu anhu) was uttered as a means of defending his own action - for which he had been refuted and criticised (grovelling to and praising a Kharijite). Just two weeks later (25th November 2015) some brothers, after returning the affair to the people of knowledge, presented the judgement upon this "Ustaadh" Abdur-Rahman Hasan. And their statements were published (Dar us-Sunnah) in audio and translation. Shaykh al-Fawzan: The Messenger (sallallaahu alayhi wasallam) wanted to dispraise and warn against them, not praise them. 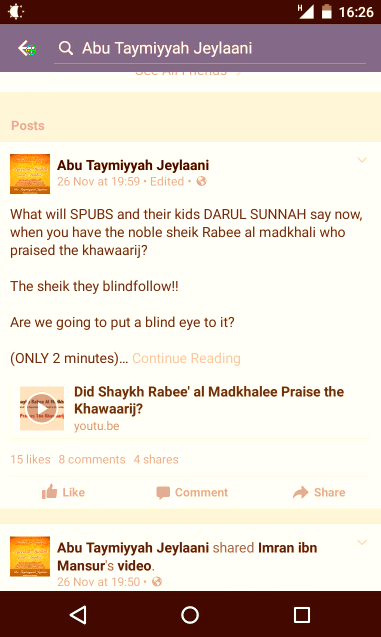 Shaykh al-Luhaydaan: This is in no way praise. This individual who says this statement is either ignorant and doesn't understand or he wishes to praise these people in order to obtain from them some worldly affairs. These are the people whom the Prophet (sallallaahu alayhi wasallam) dispraised and now in this day and age we have someone claiming that the Prophet praised them? Glorified be Allah! Shaykh Muhammad Akkur: This isn't praise from the Messenger of Allah for them. 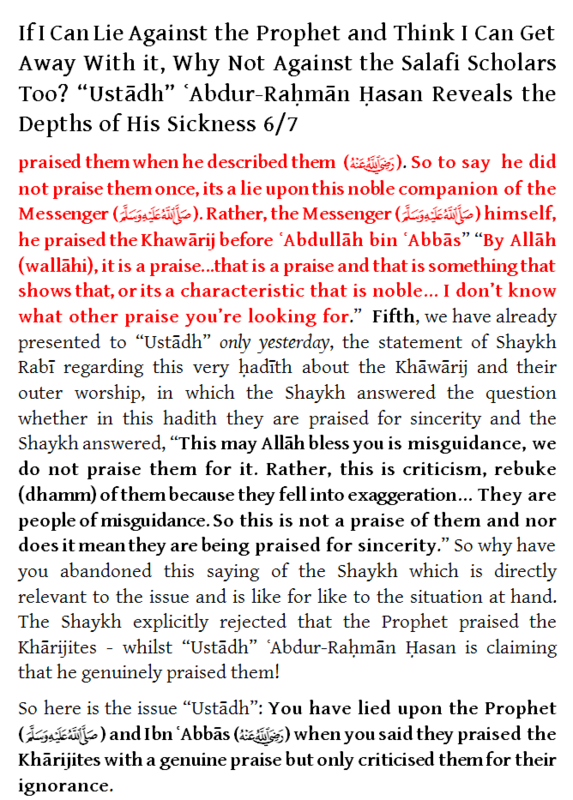 The Messenger (sallallaahu alayhi wasallam) wanted to dispraise and warn against them, not praise them... It is incumbent upon this caller to learn and to fear Allah. Shaykh Abdullah an-Najmee: No this isn't correct. This is not considered praise of them because this is a dispraise towards them due to the fact they perform acts of worship upon ignorance. Shaykh Abdur Rahman Muhyiudeen: This person is either ignorant or a donkey who does not (have correct) understanding or he is with the Khawarij. This man has no understanding and it is not permissible for him to speak about or call to Islam. Who has testified that this man is a student of knowledge so that he can even call to Islam!!? You say he is a caller, is this not correct? This man is not a caller (to the truth) rather he is a caller to ignorance and misguidance, he is not calling to the truth. So this man has no understanding. It is not permissible to listen to him, until the scholars testify for him - do you understand? His affairs becomes clears to us with these statements of his. Because these are statements about the Khawarij are not considered praise, but rather they are dispraise. And due to his ignorance and lack of understanding he thinks this dispraise (of the Khawarij) is praise. Knowing the hammer had fallen upon his falsehood and smashed it open like the shell of a nut, this mutaa'aalim then decided to go fatwa-shopping in order to find refuge and seek a way out. This is when he went to a scholar (the very same day) who in the past was criticised for permitting benefiting from the books of Kharijite Innovators and heretics such as Sayyid Qutb and Hasan al-Banna. Why did he abandon the sayings of these scholars, the major scholars, not humble himself and make immediate tawbah? Because of desires. He wanted to save his skin. He cared not that his lie against the Prophet (sallallaahu alayhi wasallam) had been exposed. "Ustadh" Abdur-Rahman Hasan published this video on his youtube channel on 25th November 2015. He obviously got to work quick in trying to refute those five scholars' statements under the guise of "responding" to Dar us-Sunnah. Basically, "Ustadh" tried to refute the five scholars - but he did it in a way to place the focus on the Dar us-Sunnah who published this videos - rather than the scholars who refuted him and declared him ingnorant and astray. If you look at the title, "Response to Dar us-Sunnah" - how can this be a response to Dar us-Sunnah? When there is not a single statement of theirs present? They conveyed the rulings of the scholars in audio and in translation, faithfully, so how can you be responding to Dar us-Sunnah. 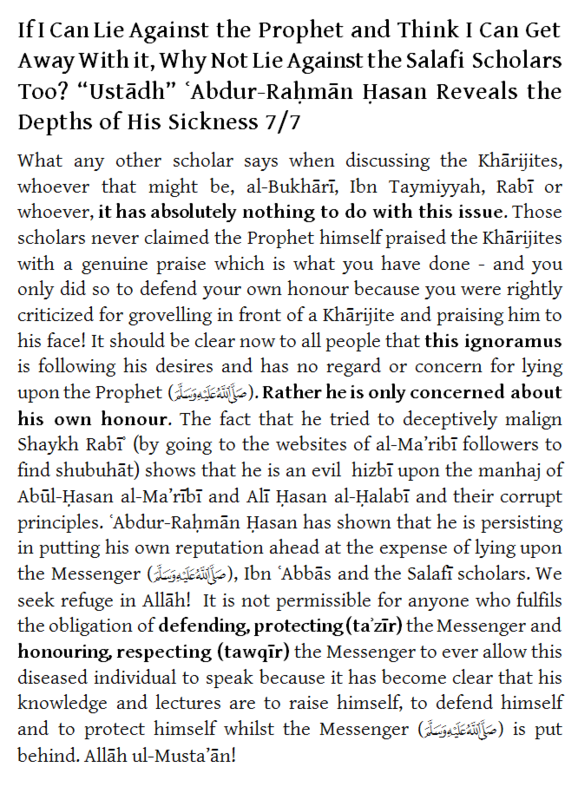 In reality, you are trying to cover for yourself and refute what these scholars said about you. 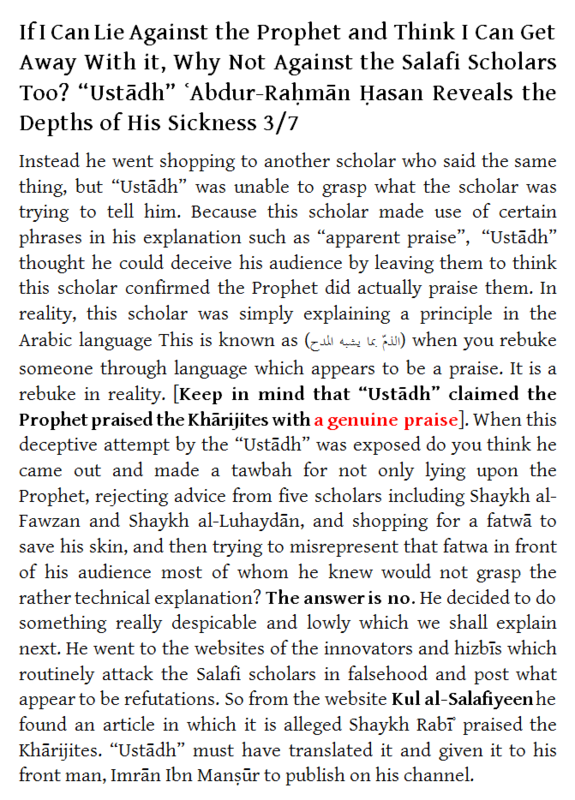 So "Ustadh" made a telelink with this scholar on the same day and this scholar tried to explain repeatedly to Abdur-Rahman Hasan that the Prophet never praised them in reality but he simply used words of rebuke and criticism which appear to be praise but which are not - and he alluded to the principle of "rebuke which resembles praise" (الذم الذي يشبه المدح), whereby rebuke is made of someone with intent, but with words that may appear to be a praise, but are not in reality. Abdur-Rahman Hasan was unable to grasp the fact that this scholar he went to was in effect saying the same thing as the other scholars. But because this technical explanation was used it allowed Abdur-Rahman Hasan and his ignorant follower, "Dawah Man" (Imran Ibn Mansur) to take the opportunity to deceive the audience. Because the audience most likely would not grasp the technical explanation "rebuke which resembles praise" (الذم الذي يشبه المدح), and because words such as "apparent praise" were used during this explanation, the audience could be left to assume that yes, this scholar said that the Prophet made "apparent praise" and so Abdur-Rahman Hasan was basically right. Now this is not the case at all, neither from near nor far, and the speech of that scholar he went to does not indicate this at all, and it is only because of his ignorance that Abdur-Rahman Hasan was left confused by the answer, he couldn't grasp what was being said and that the answer was essentially saying the same as what the other scholars had said. Over the next two days, the followers and allies of "Ustadh" such as Dawah Man (Imran bin Mansur) and another one by the name of Abu Taymiyah Jeelaanee and he is a follower of al-Hajuri, they came out on social media, twitter and facebook, trying to defend "Ustadh" upon falsehood, using weak and feeble doubts. Think about what is going on here. 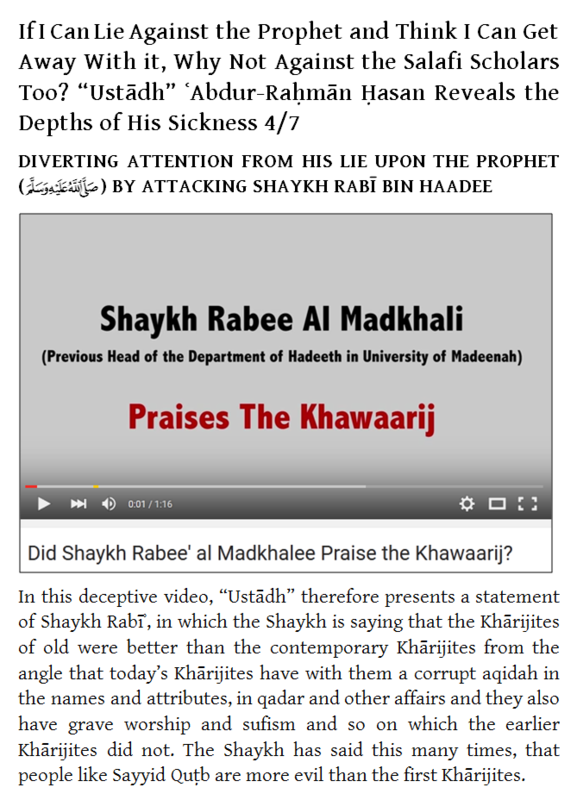 Their "Ustadh" has clearly lied upon the Prophet (sallallaahu alayhi wasallam) and they have no regard for that and decide to try and keep fighting the issue and to cast doubts and misconceptions, to twist and divert from the serious issue and to put smoke and mirrors in front of the eyes of the audience. It is clear the three of them colluded together upon falsehood to try to shield "Ustadh" from refutation for his lie against the Prophet (sallallaahu alayhi wasallam). So this cheap and feeble doubt of theirs was demolished and all three donkeys were left without any merchandise on their backs. Both of the individuals in question are ignorant (i.e. "Ustadh" and the Takfiri)... He (ISIS supporter) does not understand the true (reality) of kufr, and he is more astray than a domestic donkey. Likewise is the one who debated him ("Ustadh"), he's like a bovine animal... He (Takfiri) is more astray than a donkey. Likewise the one who debated him ("Ustadh"), he too is like him. He is aligned with him. Those people harm Islam! They do not benefit Islam. Islam is more lofty and sublime to be spoken about by the likes of such people. It is clear that Abdur-Rahman Hasan is a follower of desires, he refused to acknowledge his error, he tried to find a way out for himself and that backfired and did not work mainly because he was too ignorant to understand the answer of the scholar he ran to after he rejected the sayings of the five scholars who had been consulted about his lie against the Prophet (sallallaahu alayhi wasallam). Then the two with him, Imran bin Mansur and Abu Taymiyyah Jeelaanee tried to twist the actual issue and bring a doubt, indicating in the process that all three of them were more interested in defending "Ustadh" than fearing Allaah and aiding the truth and recanting from the lie against the Prophet (sallallaahu alayhi wasallam). Even till today, one of his infantrymen, Imran bin Mansur ("Dawah Man") continued to troll on Twitter, still defending "Ustadh" and still trying to play around the "praise", "apprent praise" issue, showing his blindness, ignorance and fanaticism. Now if this "Ustadh" Abdur-Rahman Hasan was to come out and make a tawbah tomorrow, then that is between him and Allaah, it does not change the rulings of the scholars upon him, because he has already revealed his true colors. They judged him an ignoramus, a donkey with no understanding, not a caller, not fit for teaching and so on. He may recant from his lie under all the pressure that has been put on him, but these facts will not change because they describe his reality. This is the ruling upon this individual who behaved in this disgraceful way and has put his own reputation and honour ahead of the Messenger (sallallaahu alayhi wasallam) against whom he was bold enough to lie, just so that he can defend himself and defend his evil actions of grovelling to and praising a Takfiri devil!